Gujarat govt's 23 of 28 depts "fail" to utilize budgeted funds in 2016-17; spending on development "shrinks"
While the Gujarat government has claimed that the 2016-18 budget seeks to “optimize inclusive development of human resources”, a state-based non-profit budget analysis centre has revealed that, in the outgoing financial year, 2016-17, out of 28 departments, just about five – education, finance, water resources (including Narmada), panchayat and rural housing, and revenue – would spend (or overspend) the funds allocated to them. Pathey’s figures are based on estimates made by the state department for the current financial year, which ends on March 31, 2017. The departments that would top the list in failing to utilize funds would be youth and sports (shortfall of 30.64%), followed by woman and child (27.16%), food and civil supplies (22.35%), industries and mines (21.64%), information and broadcasting (21.16%), science and technology (18.64%), roads and buildings (18.64%), and climate change (17.75%). Other important departments with a relatively smaller shortfall in utilizing budgeted funds would include agriculture and cooperatives, energy and petrochemicals, forests and environment, health and family welfare, home, labour and employment, ports and transport, social justice and empowerment, and tribal development. 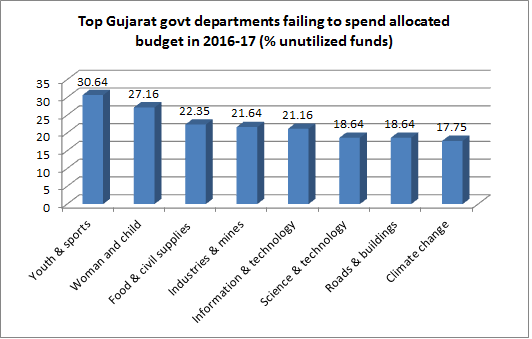 The department-wise on funds utilization takes into account both developmental and non-developmental expenditure. What is worrying, Pathey suggests, is that the shortfall in developmental expenditure is particularly glaring. Choosing economic services for analyzing the shortfall, Pathey says, a whopping Rs 5,764.14 crore, meant to be spent for rendering different types of economic services, would remain unutilized in 2016-17. The analysis has found that out of ten different heads of economic services, only under two – special area programme, and science, technology and environment – has the state government been able to fully utilize its budgetary allocation for developmental needs. All other services have failed in funds utilization. The areas where the state government would particularly fail to use up the allocations include – agriculture and allied services (allocation: Rs 6,977.25 crore, untilized funds: Rs 787.84, or 11.29%); rural development (allocation: Rs 5,634.58 crore, unutilized funds Rs 784.55 or 13.92%); industry and mines (allocation: Rs 2,604.82, unutilized funds Rs 303.83 or 11.66%); and transport (allocation: Rs 8017.77 crore, funds: Rs 566.25 crore or 7.06%). Pointing out that the state government’s expenditure is divided into three sections, out of which two are developmental (economic services and social services), and one (general services), non-developmental, Pathey says, there has been a progressive deceleration of allocation vis-à-vis the overall budget for both economic and social services over the last two years. This has further going down in 2017-18. Thus, the economic services formed 29.31% of the total budget in 2015-16, which slightly increased to 30.28% of the budget for 2016-17, but went down to 27.03% in the revised estimate for 2016-17. In the new budget, 2017-18, this has further gone down to 25.83%. As for the social services, things are no different. It was 38.27% of the budget in 2015-16, which went down to 37.42% of the budget in 2016-17, and further down to the revised estimate for the year -- 36.68% per cent. In the new budget, 2017-18, it is further down to 25.83%. Only general services, which according to the Pathey mainly include “non-developmental” spending like payment of debts, pensions and other such “essential” expenditures, the allocation increased – it was 32.42% of the total budget in 2015-16, which slightly decelerated to 32.29% in the 2016-17 budget, but was revised in the same year to 36.28%. Now, in 2017-18, has gone up to a whopping 39.42%.